Adjustable Steering Column/Wheel - Rake/Reach, Air Bag Driver, Air Bag Passenger, Air Bag Side - Front Side/Front &amp; Rear Curtain, Anti-Lock Brakes, Armrest - Rear, Body Coloured Bumpers, Central Door Locking - Remote, Centre Rear Seat Belt, Chassis - Adjustable, Child Locks - Electric, Climate Control, Cruise Control, Cup Holder, Deadlocks, Electric Windows - Front/Rear, Electronic Brake Force Distribution, Electronic Stability Programme, Exterior Lighting - Daytime Running Lights, Grab Handles, Head Light Sensor - Head Light Sensor, Head Restraints - Front/Rear, Heated Rear Screen, Hill Holder, Immobiliser, In Car Entertainment - Radio/CD/MP3, Parking Aid - Rear, Power-Assisted Steering, Rain Sensor, Rear Wash/Wipe - Rear, Seat - ISOFIX Anchorage Point - Two Seats - Rear, Seat Belt Pre-Tensioners - Front, Seating Capacity - Five Seats, Self-Levelling Suspension, Start/Stop System - Start/Stop System, Steering Wheel Mounted Controls - Unspecified, Telephone Equipment - Bluetooth Interface, Third Brake Light, Tinted Glass - Unspecified, Touch Screen Monitor - Touch Screen Monitor, Traction Control System, Upholstery Leather, Voice Activated Controls Santorini Black metallic paint. 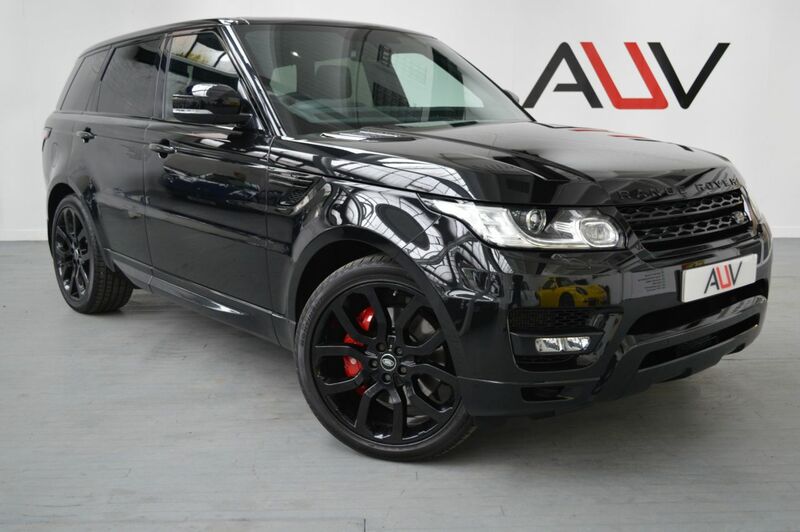 We are pleased to offer you this stunning Range Rover Sport with the following specification. Sliding panoramic glass sunroof, 22-inch black gloss alloy wheels with red callipers, Black Oxford Perforated Leather, Electric heated memory seats with lumbar, Heated rear seats. Dual zone climate Air conditioning, Ambient lighting pack, Cruise control, Body colour painted roof, Gloss black grille and vents, Black model badges, Body coloured bumpers side skirts and Xenon headlights with heated washer jet system, 8 inch Touch-Screen, Audio System - DAB Radio, Bluetooth Phone Connection, Cruise Control, Front and Rear Park Distance Sensors with Visual Display and Rear Parking Camera, HDD Navigation System, , Heated Windscreen, Hill Descent Control (HDC), Intelligent Stop/Start System, Push Button Keyless Start Stop, Radio, Single CD / DVD Player, MP3 Compatible Audio Disk, Rain Sensing Windscreen Wipers, Tyre Pressure Monitoring System (TPMS), Voice Control for Navigation, Powered tailgate. Before you reserve a vehicle we ask that you read both our Business and Warranty conditions in the 'Terms' tab above. Specialists in vehicle financing we can offer our clients market leading, bespoke funding packages. Finance examples are subject to status, regulated and monitored by the FCA. Goods and services are supplied by Approved Used Vehicles Ltd. For further information on how to reserve this vehicle or tailor your finance package please call us on 01455 446505.